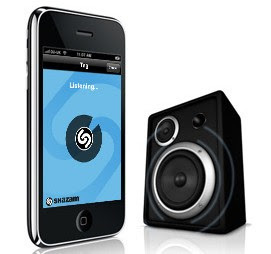 Shazam is a free mobile application that identifies music playing anywhere. The company calls themselves the 'world's leading mobile music discovery provider'. When you hear a song you like, you simply place your mobile device near your radio, TV, a film or in a store and hit the 'Tag Now' button. Shazam analyzes the song and, in less than fifteen seconds, indicates the song, album and artist and allows you to share the 'tag' with someone, view artist discographies and biographies and watch videos from YouTube. You can also download the song from iTunes and add photos to your tags from where you hear the song. Shazam is amazingly accurate. While using an iPhone in my car, it recognized 'Bluebeard' by the Cocteau Twins (from the radio) and 'Black Tambourine' by Beck (from a CD). I have to say, however, that the iTunes download function was hard to find. I expected to find it on the Tag details screen but was surprised to have to drill several levels into the artist discography while having to remember which album the song was from. Users of Shazam would benefit from having the iTunes function right on the Tag details screen. Have you tried using midomi? There is a link to buy from iTunes readily viewable. No, because Shazam was free. I'll have to check midomi out or borrow your iPhone :-).